Something strong is brewing in a fourth-floor Stony Island suite. Patrick Ip, a second-year, runs Café 4B out of his dorm each Saturday. His café is one of only two in Chicago to offer cutting-edge syphon brewed coffee. 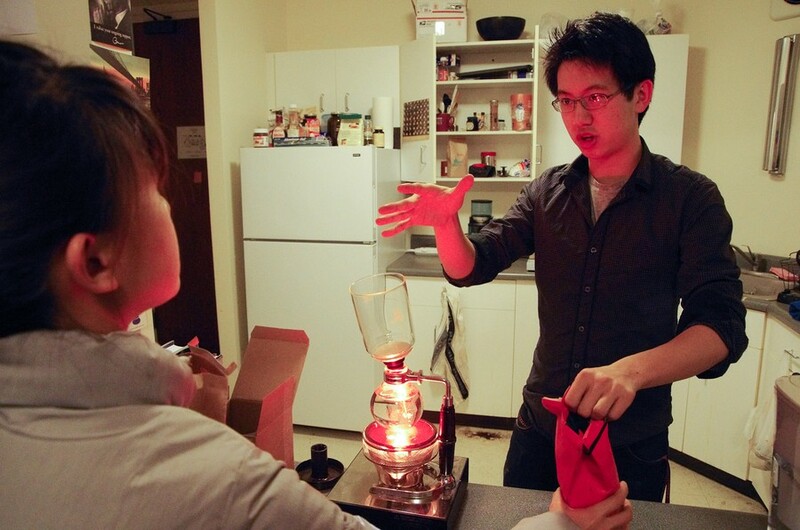 With a halogen-heater and specially made glass containers, Ip’s syphon coffee machine looks more like lab equipment than a dorm room kitchen accessory (and is worth about as much—the equipment costs hundreds of dollars). The Japanese-inspired system, also called vacuum brew coffee, relies on heat from water vapor and vacuum pressure to brew coffee by the cup. The result is “one of the freshest, purest ways to drink coffee,” according to Ip. Intelligentsia’s downtown location is the only other store in Chicago to brew syphoned coffee, which was recently called a “20,000 dollar cup of coffee” by The New York Times. But Ip’s current menu lists no prices. Instead, he requests tips to avoid legal issues. As for profit, Ip said it depends on the customers; he recognizes that high quality coffee drinks fall outside the typical student’s budget. Ip views the café not as a money-making venture, but as a way to practice his barista skills and share his coffee education, which he believes customers miss when they pick up coffee at local shops. With an extensive international coffee training background, it’s only fitting that Ip grounds rare beans hailing from Nicaragua and London. Ip studied coffee preparation in Australia while working for the United Nations Youth Committee. He completed courses in Espresso Preparation and Latte Art at the New South Wales Technical and Further Education Commission and learned the syphon brewing method at the Sensory Lab in Melbourne, Australia. In addition to syphon coffee, Café 4B offers hot chocolate, espresso, and iced coffee drinks. Stony Island first-year Julie Huh joined Ip in his venture, providing baked goods for the Saturday hours of operation. Ip cleared his plan with his resident head Jody Otte—himself a former Starbucks employee and now regular customer—and opened for business in early fall. The café has since expanded through a Facebook page, with 112 followers and updates that range from newest beans to information on local coffee culture. The café has served as many as 40 customers on a Saturday morning and on average sees between 10 and 20 patrons, comprised mostly of other Stony Island residents and University students. Ip even offers to-go cups and a “drive-thru” experience—he runs out with a cup of coffee and hands it to a customer who drives by on his way to work at seven in the morning. Café 57 owner Tony Wilkins was among the Saturday customers at Café 4B last week. Ip says he’s learned from Wilkins’s entrepreneurial efforts, and the relationship has been mutually beneficial—he says their respective coffee shops cater to different audiences and are not in competition. Ip is part of the third-wave coffee movement, aiming to produce high quality, artisan coffee drinks. In addition to his special equipment, Ip serves beans roasted by third-wave roasters like Blue Bottle Coffee from San Francisco, Intelligentsia coffee from Chicago, and Cup of Excellence. The first wave of coffee was the invention of coffee, and the second wave of coffee brought it to the masses, through businesses like Starbucks and Folgers. Ip brought his machine to his hometown Starbucks in Modesto, CA to compare systems—Starbucks brews coffee using the more traditional and less expensive drip-system. He used the same beans, but brewed them using the different techniques, and Ip said the syphon coffee strongly came out ahead. Still, Ip understands the value of a quick, cheap cup of joe. He praised student-run coffee shops for the ability to fill a niche and produce cheap coffee to serve the student audience. “The Div School [Divinity School coffee shop] takes the cake for best quality for price,” he said. The experience—not the caffeine—is Ip’s end-goal in creating coffee. He limits his own intake to just a few cups a day, and spends free time studying skills such as latte art and new brewing techniques.